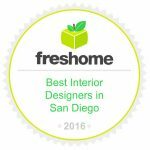 We are an innovative and collaborative interior design studio based in San Diego. Distinctive and unique interiors which blend classic and contemporary to deliver a fusion of aesthetic style; definitive luxury and practical comfort. We collaborate from the beginning with project architects to create ultimately exclusive lifestyle interiors. Our team boasts meticulous attention to detail whilst being super friendly, efficient and professional. You will always achieve exceptional return on your investment working with us; we are property development experts. Anna advised us on our kitchen and bathroom. When we sold one year later our house increased in value 20%, a large component of this came from the design specifications that Anna recommended from the remodel.